...Without Slaving Away in the Kitchen! Watch this short video to learn more about Bone Appétit! Click the play button below to start the video! In just a few moments, I’m going to show you how you can eat your way to strong and healthy bones. But first, I want to be sure that you understand that the real secret to bone health is found in giving your body the fuel it needs to be healthy. If you’re already familiar with my Osteoporosis Reversal Program, this should come as no surprise. The foods you put into your body have a direct connection to the health of your bones. If you eat foods that tip the balance of your body in the wrong direction, your bones will suffer. But eat foods that tip the balance in the right direction and your body can do what it is designed to do… which is to keep you healthy. What you might not know, however, is what dishes are best for someone who wants to build healthy bones. And that’s why I’m so excited to announce my new Bone Appétit Cookbook. It takes all of the guesswork out of preparing bone healthy meals (that taste great) for you and your family. If you’ve ever struggled with finding the time to figure out how to eat bone healthy food every day, then this will fix that for good! Never again will you be stuck wondering what to make for breakfast, lunch or dinner. And better yet, you’ll have the confidence knowing that what you’re feeding your body is going to help you improve the health of your bones. I’d like to show you what’s inside of Bone Appétit. WARNING: Going any farther could make you hungry! Bone Appétit does all of the hard work for you! Best of all, the recipes are created with my 80/20 pH ratio of alkalizing vs. acidifying foods in mind. 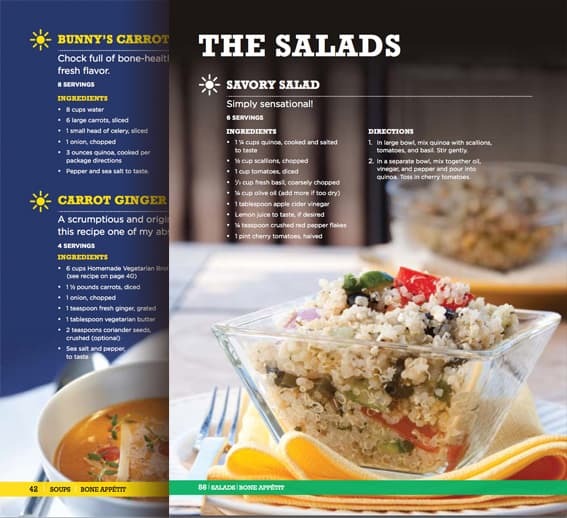 Just look at the table of contents or even the mouth watering pictures and get a bone healthy meal on the table fast. 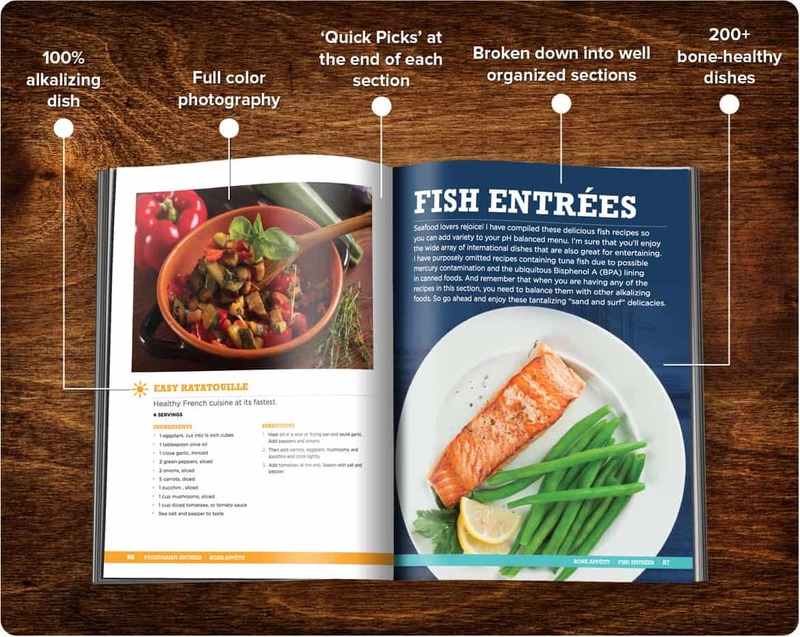 Just look through the table of contents or at the mouth watering pictures and get a bone healthy meal on the table fast. The photos alone are enough to make your mouth water. 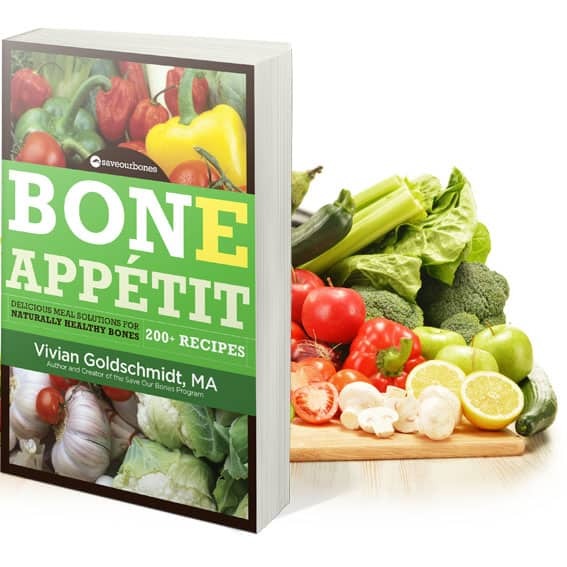 Over 200 mouth-watering bone healthy recipes. Inside Bone Appétit you’ll find over 200 recipes for Breakfast, Smoothies, Appetizers, Soups, Salads, Vegetarian Dishes, and plenty of Main Courses, including Fish, Poultry, and Beef, and even an entire Dessert section! Recipes such as Cherry Walnut Bars, Mediterranean Sunrise, Pears ‘R’ Peachy, Guacamole Surprise, Curried Pumpkin Bisque, Alkaline Bliss, Vegetable Soup, Symphony Salad, Bistro Chili, Pasadena Citrus Pasta, Coconut Crusted Salmon, Fish N’ Fab, Waldorf Chicken, Jade Treasure, Stir-Fry, Mango Steak Delight, Country Peach Cake, Nutty Brownie Cake, Raisin Oatmeal Muffins, and many, many more! Short on time? ‘Quick Picks’ can help. If you’re ever short on time, you can just flip to the “Quick Picks” section where you’ll find a selection of bone healthy recipes you can prepare in 20 minutes or less! Eating bone-boosting ‘Foundation Foods’ just got a whole lot easier. Many dishes in Bone Appétit contain ‘Foundation Foods’ so that you can get all their bone-building benefits. These are foods that offer double the bone-building benefits of regular foods. They contain the ‘Foundation Supplements’ in their natural form. 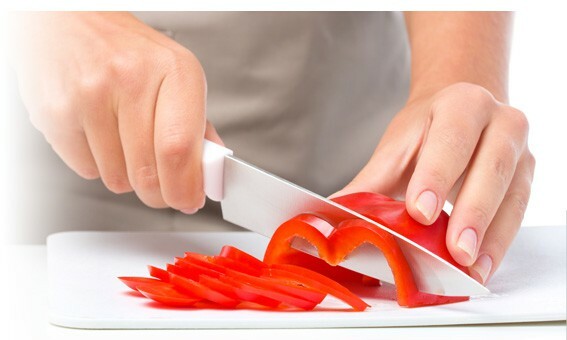 From how to easily skin a tomato to the secret to peeling garlic, Bone Appétit even includes cooking tips and tricks that make preparing delicious bone-healthy meals even easier. BONUS! Bone healthy meals planned for you for the next 30 days! For a limited time, when you order Bone Appétit, you’ll get a copy of the ’30 Day Meal Planner’ absolutely FREE! 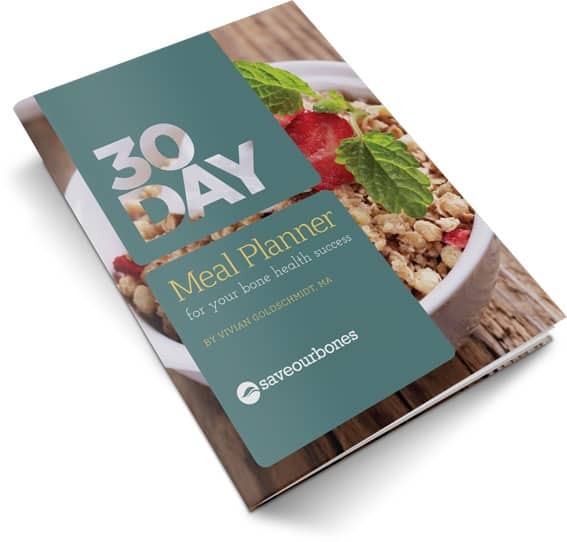 With the handy 30 Day Meal Planner, just pick a day, pick a meal and start enjoying delicious bone healthy meals. A lot of the recipes come right out of Bone Appétit (you’ll get the page numbers in the planner) and you’ll get two extra pH balanced snacks a day. Here’s what you get when you order Bone Appétit today. Now you can have 30 days of bone healthy meals planned out for you! They’re all in an easy to reference 30 Day Meal Planner for you. A lot of the recipes come right out of Bone Appétit. 30 Day Meal Planner is not available for sale, but you’ll get a copy of it absolutely free today with your order! Bone Appétit already does all of the hard work for you! And now, with the 30 Day Meal Planner, you don’t even have to think about what to make or when, because it’s all laid out for you. Just pick a day, pick a meal and start cooking! Get great nutrients with a fraction of the work of juicing. When done correctly, blending is faster, easier and even possibly healthier than juicing! 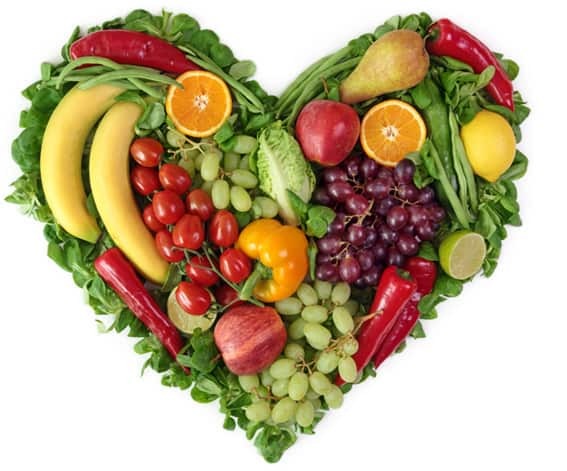 When you blend your fruits and vegetables, you’re actually eating all of what nature intended you to eat. That includes the juice and fiber. 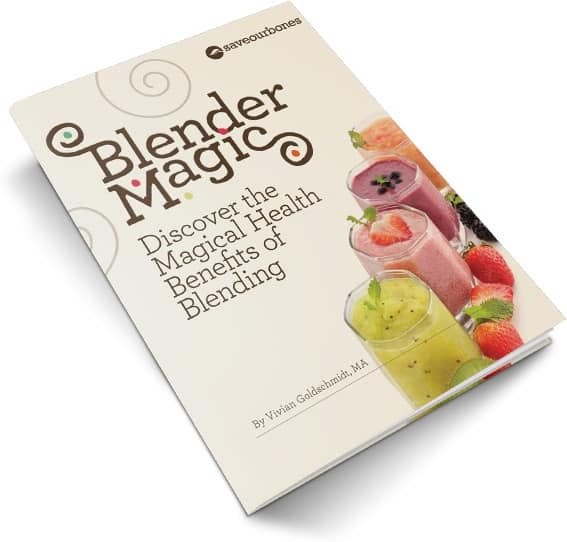 And the good news is that Blender Magic is absolutely free when you order Bone Appétit today. It is no secret that calcium plays a vital role in maintaining and strengthening your bones. But not all types of calcium are equal. The most efficiently absorbed calcium is organic, derived from natural wholesome foods. 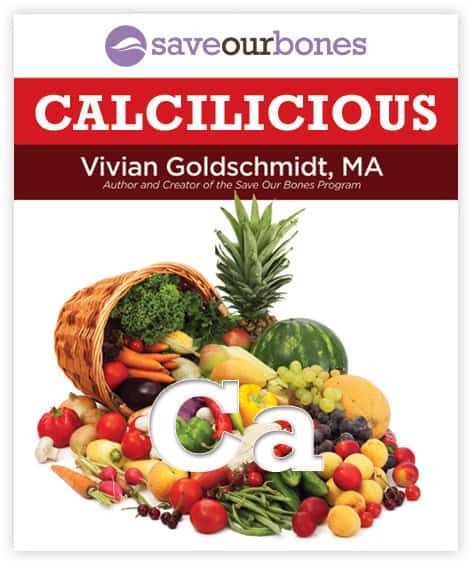 With the delicious calcium-rich recipes found in Calcilicious you’ll boost your organic calcium intake without the unhealthful side effects of milk and unfermented dairy products. The unique and unconventional vegetables used in this book can be found quite easily in your supermarket’s produce section. You will discover that as you expand your culinary horizons, you’ll also be helping your bones become strong and healthy. 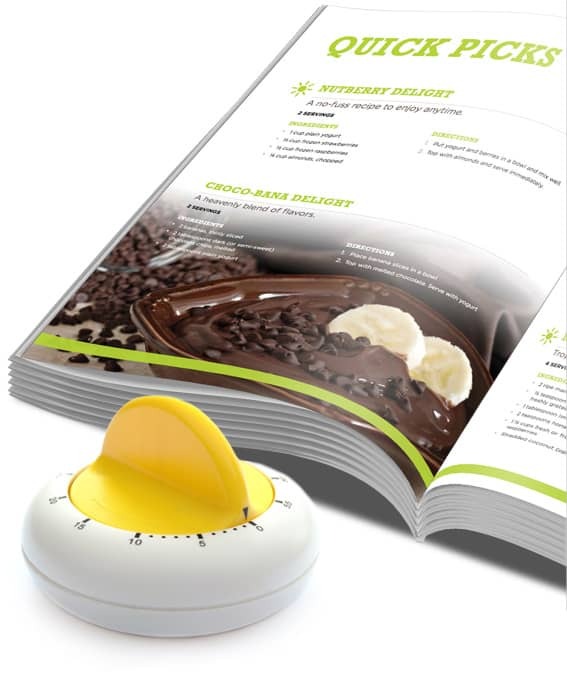 This handbook contains the very best calcium-rich recipes, comprised of the most wholesome ingredients. Get Bone Appétit Now and Get All 3 Bonuses FREE! We want you to be 100% satisfied or your money back! If you’re not satisfied with Bone Appétit for any reason, please contact us (via email) within 60 days for a full, prompt, and courteous refund — no questions asked. 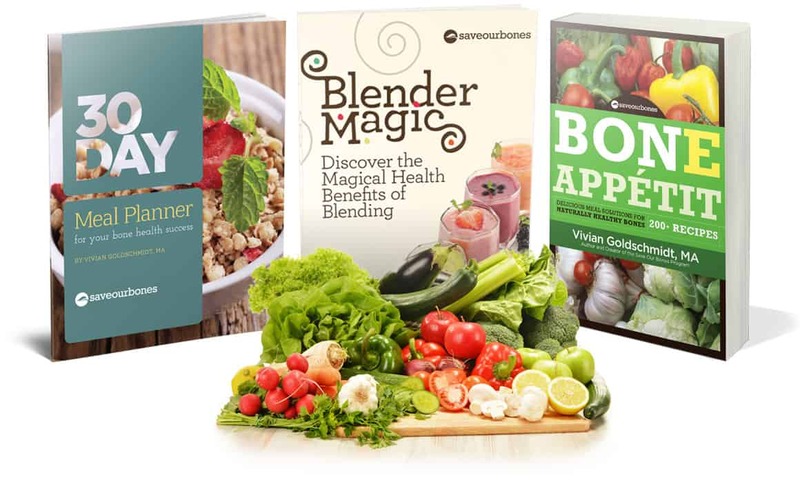 You’ll get instant digital access to the Bone Appétit book along with the following FREE bonuses: The 30 Day Meal Planner, Blender Magic, and Calcilicious. How many pages is Bone Appétit? 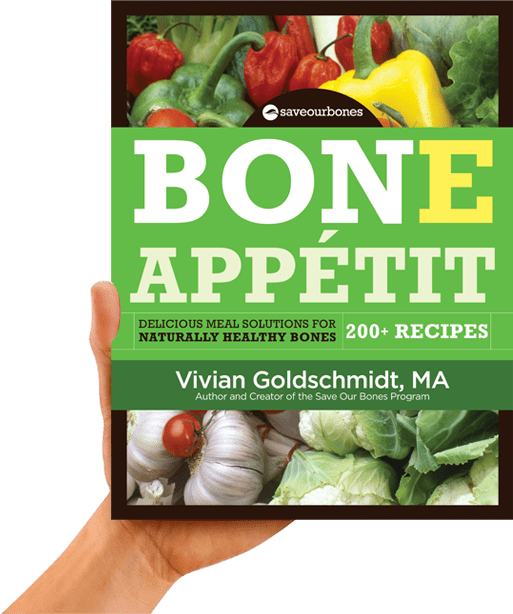 Bone Appétit has over 130 pages with more than 200 recipes for Breakfast, Smoothies, Appetizers, Soups, Salads, Vegetarian Dishes, and plenty of Main Courses, including Fish, Poultry, and Beef, and even an entire Dessert section! Can I purchase the bonuses separately? The bonuses are included for FREE only when you order Bone Appétit. They’re not available for sale individually as they reference many recipes in Bone Appétit. How can I order Bone Appétit? Simply click on the ‘Add To Cart’ button and fill out the information on the page and you’ll get access to the digital downloads (PDF). And rest assured that all your information is safe and secure. The entire transaction takes place on a secure server using the latest available technology. 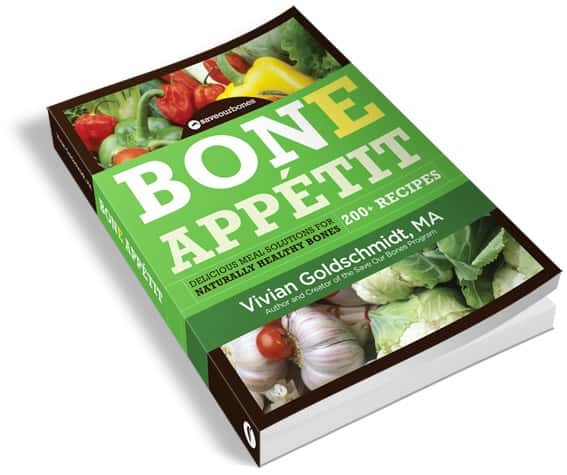 If you’re serious about the health of your bones and want to avoid countless hours of researching bone healthy foods, let alone trying to combine those foods into something you will love to eat, then get your copy of Bone Appétit today. Give your body the fuel it needs to keep your bones healthy and strong. 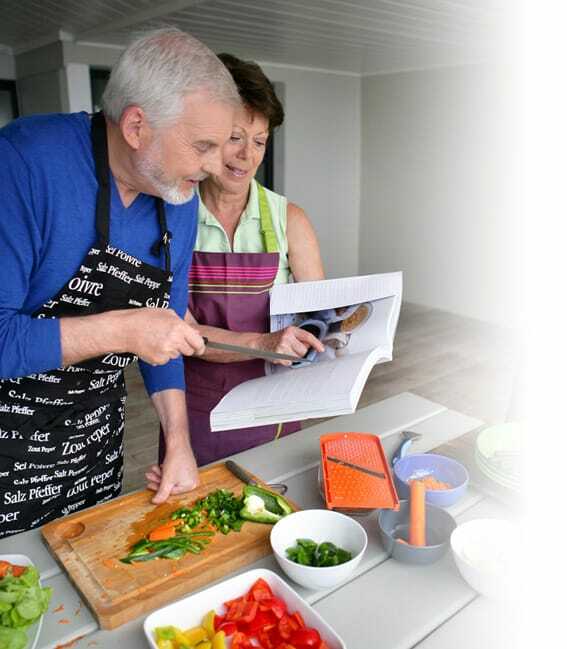 With Bone Appétit, you’ll never again struggle to find bone healthy recipes that you can make in minutes! P.S. Many dishes in Bone Appétit contain something I call ‘Foundation Foods’. These are foods that offer double the bone-building benefits of regular foods. They contain the ‘Foundation Supplements’ in their natural form. You want to be eating these foods and the recipes you’ll find in Bone Appétit make it easy!